Muncie Evening Press, March 11, 1972, accessed Newspapers.com. 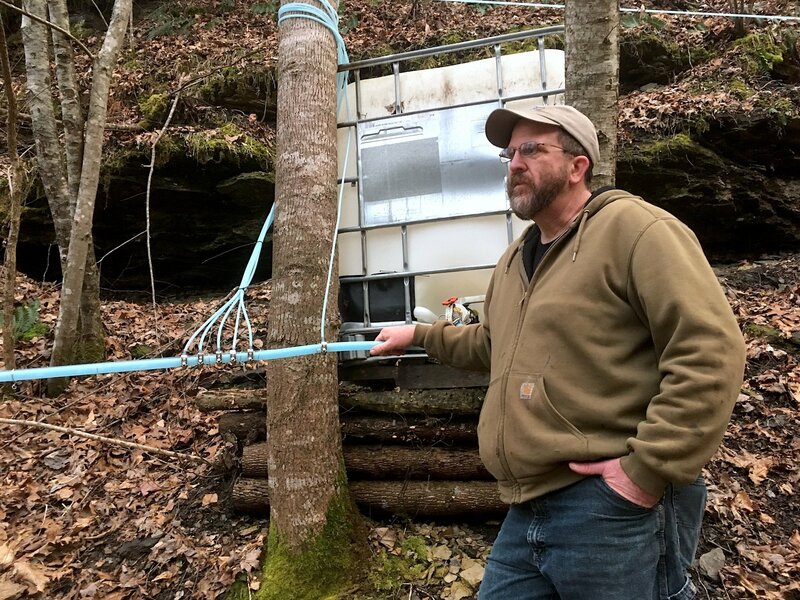 Delegates from Illinois suggested fines and prison sentences for businessmen found guilty of discriminatory practices. North Carolina attendees proposed a bill of prisoners’ rights that included humane treatment and fair trials. 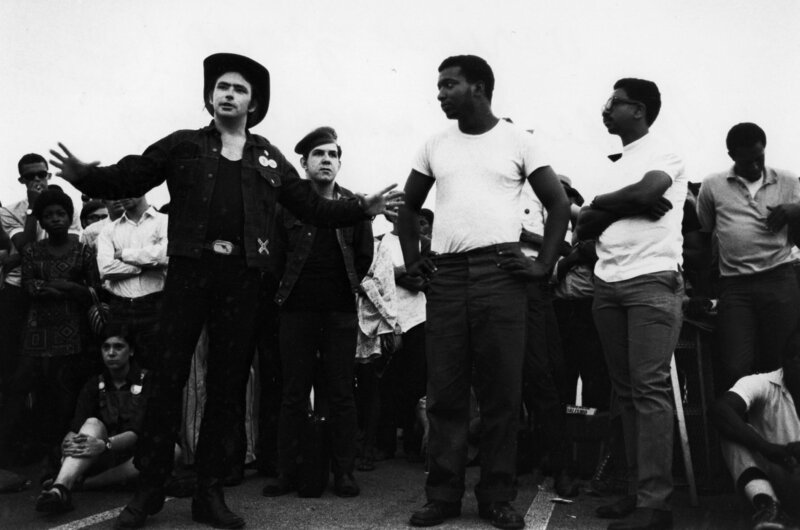 Delegates from Indiana and other states demanded that the U.S. dedicate resources to the plight of black Americans rather than the Vietnam War and end the conflict immediately. North Carolina representatives also urged that black men receive Social Security benefits earlier than white men since their life expectancy was eight years shorter. The Muncie Evening Press noted that “Politicking was intense…as state delegations tried to compromise their own views with positions they felt other delegations could support.” Tensions ran so high that part of the Michigan delegation walked out of the convention. While similar in many aspects, the men’s speeches hinted at the divergence in philosophies pervading the convention. Hatcher believed change could come from within the existing two-party system, so long as the parties responded to the needs of African Americans. However, if legislators continued to neglect black constituents, black Americans would create a third party and, he told attendees, “we shall take with us the best of White America…many a white youth nauseated by the corrupt values rotting the innards of this society…many of the white poor…many a White G.I….and many of the white working class, too.” The party would also welcome “chicanos, Puerto Ricans, Indians [and] Orientals” (Indianapolis Recorder). 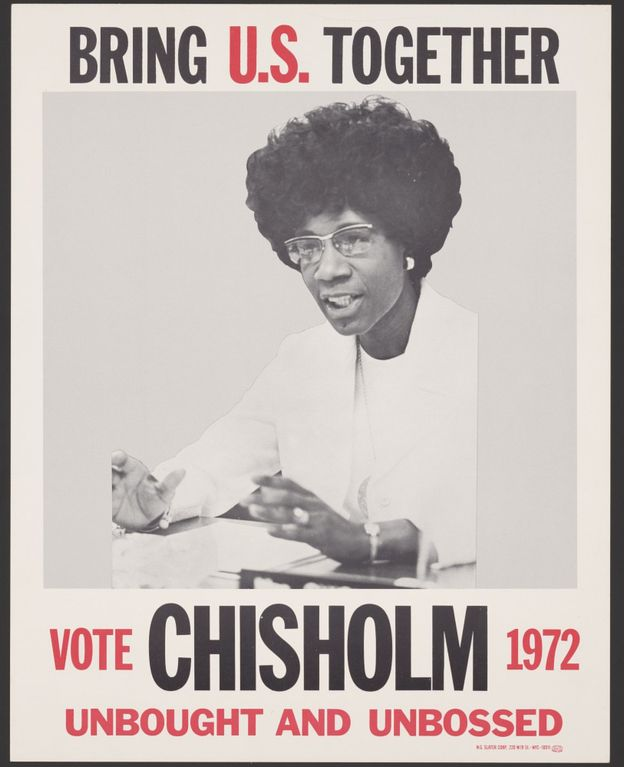 Presidential campaign poster courtesy of the Library of Congress. After intense debate, a steering committee tentatively adopted a National Black Agenda. The committee officially published the sixty-eight-page document on May 19, Malcolm X’s birthday. The resolutions included black representation in Congress proportionate to the U.S. black population, a guaranteed minimum income of $6,500 for four-person households, a 50% cut in the defense and space budgets, and an end to national trade with countries that supplied the U.S. drug market. The resolutions, designed to move black Americans towards “self-determination and true independence,” represented major, yet tenuous compromise among the black community. The steering committee also formed the National Black Political Assembly, a body tasked with implementing the Black Agenda. 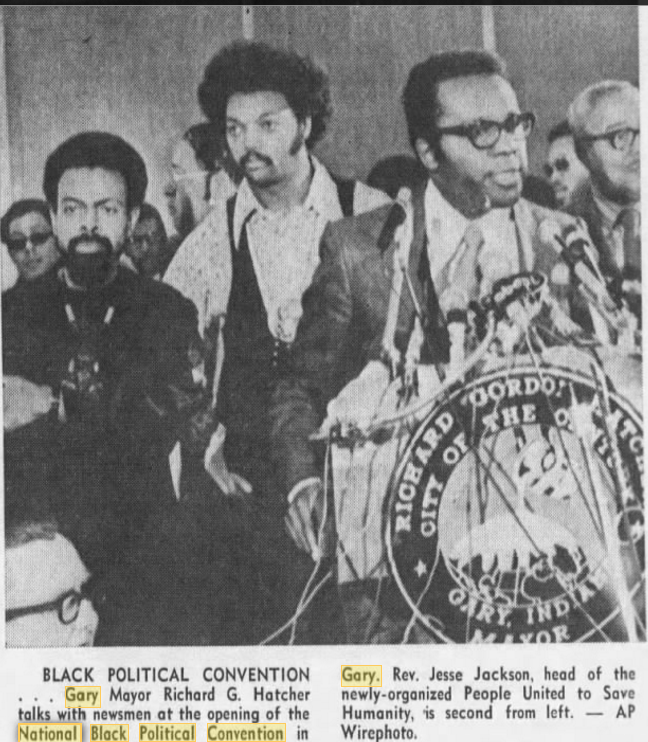 Dr. Daniels noted that, although many of the agenda’s resolutions never materialized, “thousands of Black people left Gary energized and committed to making electoral politics a more relevant/meaningful exercise to promote Black interests.” He attributed the quadrupling of elected black officials by the end of the 1970s, in large part, to the Gary convention and the “audacity of Black people to…defend black interests.” The NBPC was notable too for its inclusion of black Americans from all walks of life, rather than just prominent black figures, in formulating how to ease the struggles of the black community. The Recorder also noted that Mayor Hatcher’s reputation “has been considerably burnished in the white community as well as the black by the success of the historic event” (Indianapolis Recorder). This story was originally published by the Indiana History Blog, a project of the Indiana Historical Bureau. Nicole Poletika is a historian with the Indiana Historical Bureau. She is a regular contributor to the Indiana History Blog. Cover Photo: The Rev. 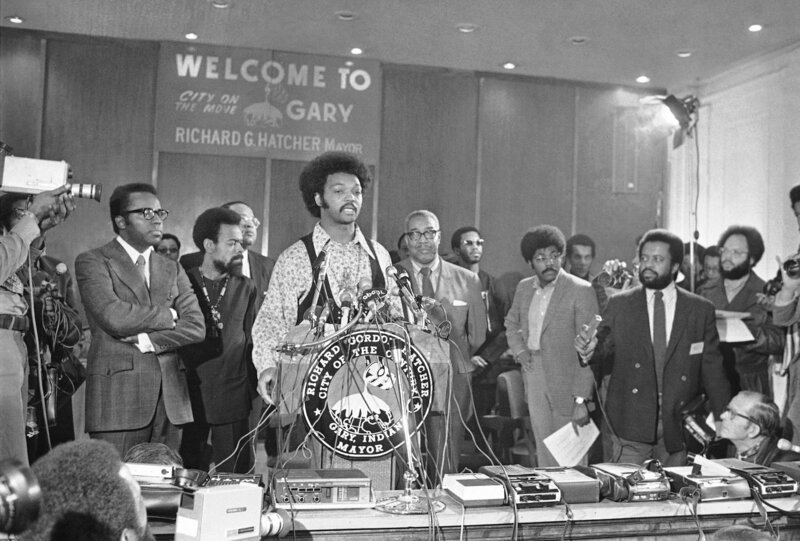 Jesse Jackson talks to press at the opening of the National Black Political Convention in Gary, Indiana, March 11, 1972. Gary’s Mayor Richard G. Hatcher, left, and Amiri Baraka, the former LeRoi Jones, look on. Photo: AP/Charles Knoblock.